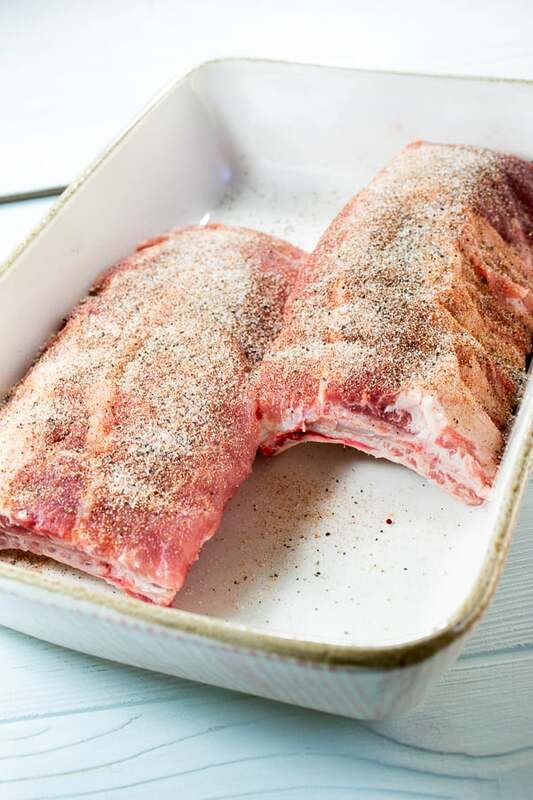 These ribs only have 3 steps, a simple dry rub, and you finish them off in the oven with some tangy, sweet BBQ sauce. 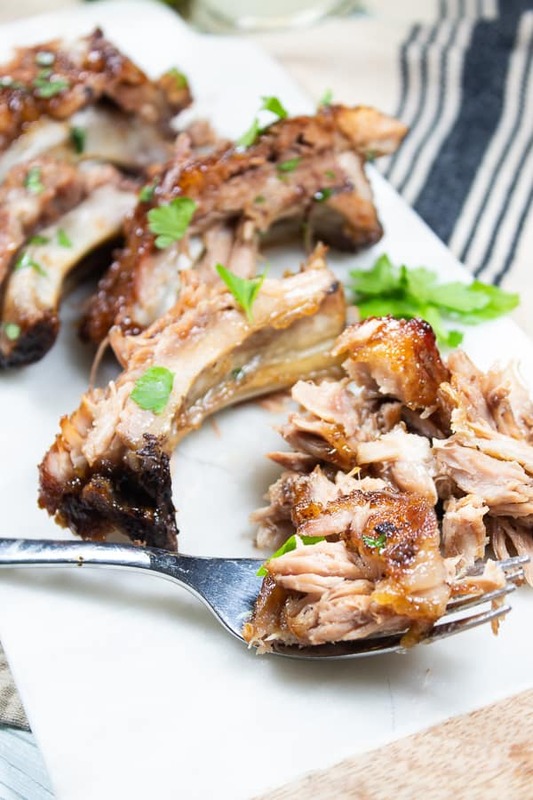 These 3 Step Fall Off the Bone Oven Baked Ribs are foolproof! 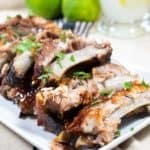 I am a rib newbie; My Father in Law makes the best ribs you’ve ever had and this is his recipe! I was so proud of myself for making these ribs to perfection, normally I’m a chicken girl, but these are so simple anybody can make them. Easy and tender- perfect for a weeknight meal or a party! First Step: Remove the membrane. This thing is a slippery little sucker, but removing it makes for the most tender, fall off the bone ribs. I removed mine by using kitchen scissors to cut the far left side of the membrane, and pulled. Sometimes it comes off all in once piece, sometimes it doesn’t. THIS is a great tutorial- I like that it recommends using a paper towel to pull off the membrane, makes it a lot easier. Remove the membrane- say it with me- remove the membrane! Second Step: I cut my ribs into 2 slabs (this is optional and depends on the size of your pan), then added a light dry rub mixture. Mix a little dry rub, rub, bake, and slather. That’s it! Third Step: Cover pan tightly with foil, and bake for 3-4 hours, until ribs fall off the bone and they reach an internal temperature of between 190 and 205 degrees. Guys! You’re already 95% there! Next step is to make them caramelized and sticky. Though optional, I do totally recommend this step. 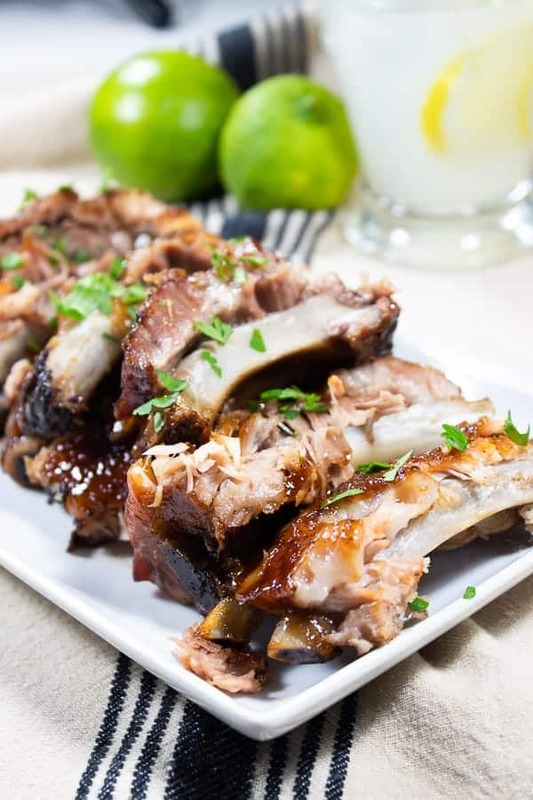 Fun fact- ribs are actually cooked when they reach 145 degrees, but the collagen and fat breaks down between 190 and 205 degrees, giving you that fall off the bone, delicious and juicy rib you want. How do I get my fall off the bone ribs all caramelized and sticky? Once your ribs are done cooking low and slow, you’ll baste them with BBQ sauce, and broil them for just a few minutes to get a sticky, caramelized finish. What kind of BBQ Sauce should I use with these fall off the bone ribs? Store bought BBQ sauce is totally fine, we do have a homemade BBQ sauce recipe here if you’re interested. I used regular, store bought Sweet Baby Rays and added some honey and lime juice- my dad did this growing up with BBQ chicken and it’s the BEST mixture (P.S. Hi, Dad :). Baste with loads of BBQ sauce! What’s the best way to serve these ribs? I cut my ribs into individual pieces, and served them on the bone. You can serve these OFF the bone and use the meat as a topper for salads, on quesadillas, inside wraps, or sandwiches. Having a BBQ? Serve these ribs on a nice big old wooden platter. Keep a jar of honey next to them for drizzling! What can I serve with these fall off the bone ribs? These ribs are fabulous with a nice crisp salad. Serve with this wedge salad platter for a crowd! You can’t have ribs without baked beans. I mean, you can, but why would you?! This recipe from Tastes Better from Scratch NAILS baked beans! Rolls; Everybody loves bread with ribs. Heck- spread some mayo, add some iceberg, fill with rib meat and you got yourself a homemade rib sandwich! Buy store bought or make your own with this easy recipe. Potatoes! Ribs and taters go together like well, ribs and taters. Mashed potatoes would be delicious and we LOVE this slow cooker recipe since it’s so easy. Potato salad with ribs is always a winner and if you want a fun variation, try this Bacon Sriracha Potato Salad from Peas & Crayons. Corn on the cob is always a winner; Wrap your corn in foil with a tsp of butter and liberal salt and pepper. Bake at 400 degrees Fahrenheit for 30 minutes. See the way they just shred by themselves? You can literally pull the bone out of these ribs, they are so good! Don’t skip removing the membrane, its not that hard to remove and makes all the difference. I baked my ribs in a ceramic casserole dish- I did this because the juices from the ribs can run heavy, and it helps keep everything moist in the pan, creating the most tender ribs you could hope for. You can follow my dry rub recipe, or you can buy store bought. Up to you! 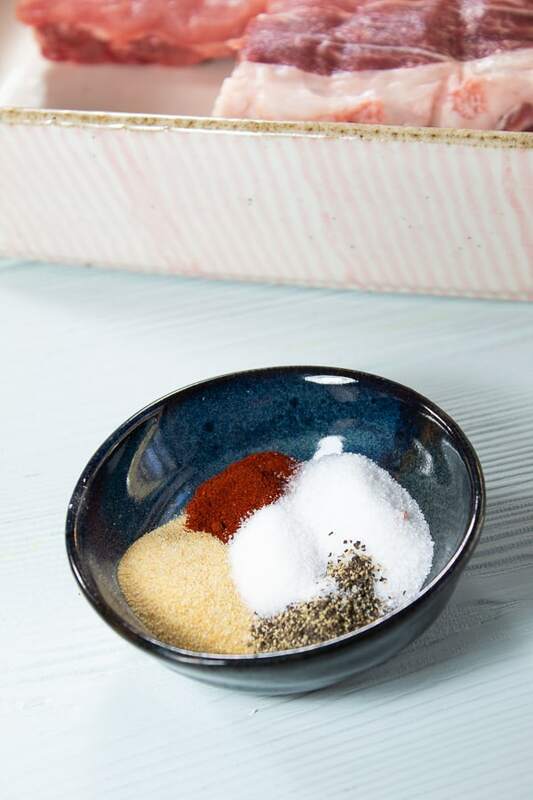 Switch it up to your liking- if you like spicy, add some crushed red peppers or some cayenne. THIS seasoning from Flavor God is terrific- and healthy. For the BBQ sauce I used, I mixed Sweet Baby Rays with 2 tbsp each of lime juice and honey. I like my sauce sweet. 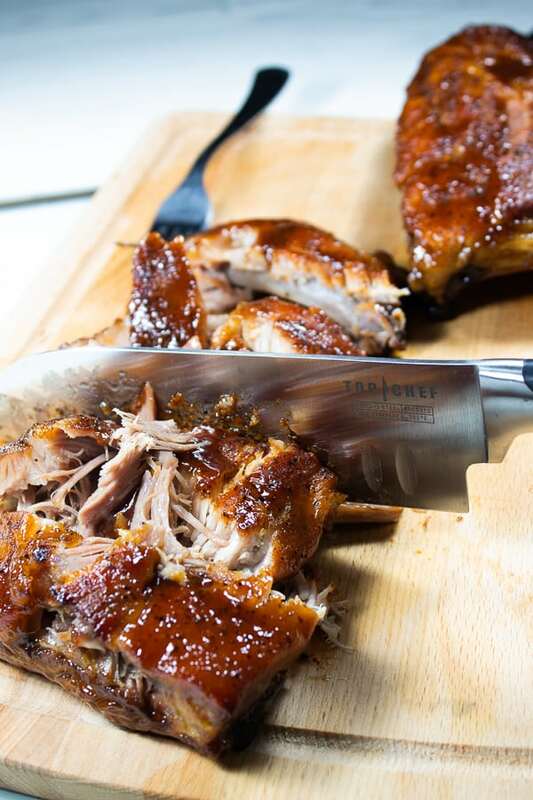 You can make your own BBQ sauce, or use your favorite store bought brand. 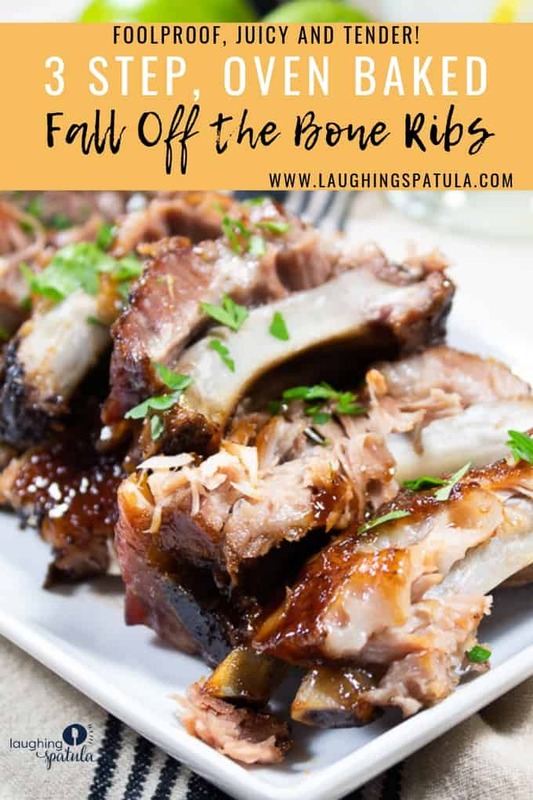 Check out this video to make these delicious fall off the bone ribs; they are super simple and so easy! 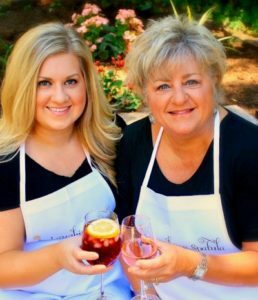 Need some other great, easy and delicious recipes? We got you covered! This sheet pan sausage and veggies is delicious and nutritious- it’s bright colors are great for any time of the year! Our healthy Mexican casserole is so good- stuffed with veggies and smothered in enchilada sauce. This honey glazed sheet pan salmon and veggies! Delicious garlic and honey make for a flavorful weeknight meal. 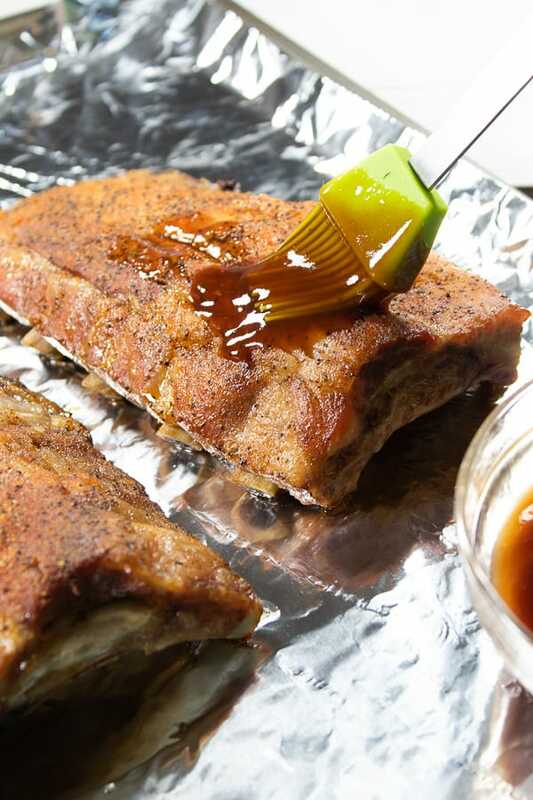 Delicious, tender, fall off the bone ribs that ANYBODY can master, all made in the oven! 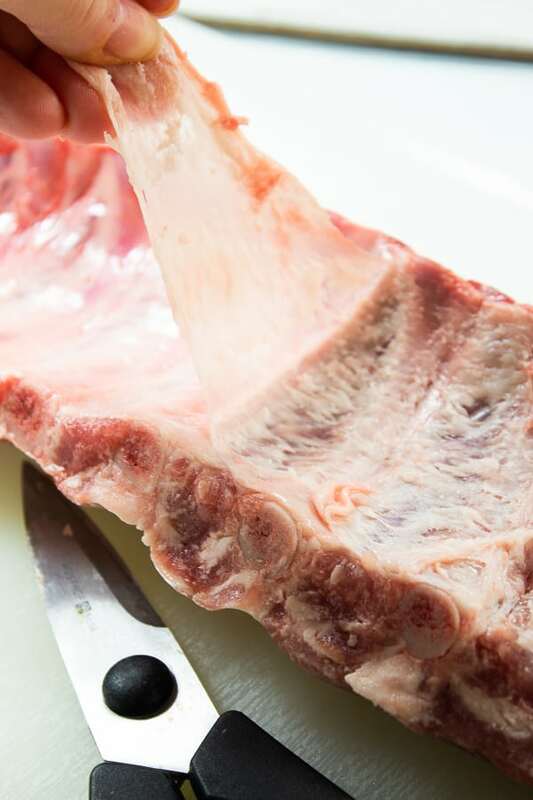 Remove membrane from ribs. Rub ribs with dry rub on both sides. Place ribs in oven safe dish (casserole dish works well) with meat side up. Cover tightly with foil and bake for 3-4 hours, or until rib temperature reaches at least 190 degrees, but no more than 200 degrees. Remove ribs from oven. Baste with BBQ sauce, and broil at 525 degrees fahrenheit for 3-5 minutes to caramelize BBQ sauce. Don't skip removing the membrane, its not that hard to remove and makes all the difference. You can follow my dry rub recipe, or you can buy store bought. Up to you! Switch it up to your liking- if you like spicy, add some crushed red peppers or some cayenne.